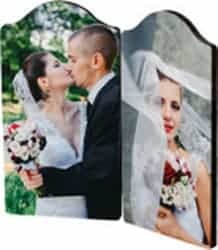 ChromaLuxe™ Hinged Panels are unique hardboard panels that fit together in various configurations to produce panoramic or complimentary sets of images. Made to sit on a mantle or shelf, these panels do not need easels or mounting aids. 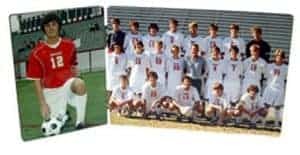 These easy to assemble panels are available in various sizes and either a flat or an arched top. 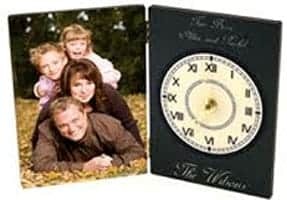 They feature an advanced, highly durable and extremely smooth UV resistant coating bonded to the 1/4” and 5/8” plaques. 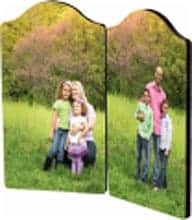 Item UNI5861 * Chromaluxe Photo Panel, 5″x7″ x 1/4” (x2) , Arch Top, Double Hinged. (Add on inner panels with UNI5862). Put photos on each panel that complement each other. Item UNI5862 * Chromaluxe Photo Panel, 5″x7″ x 1/4” (x2) , Arch Top, Double Hinged. (Add on inner panels with UNI5862). Put photos on each panel that complement each other. 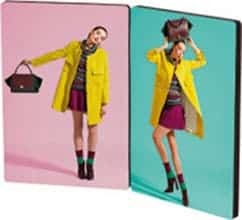 Item UNI5863 * ChromaLuxe™ Photo Panel 3.5” x 5” x 1/4” – 5×7 HINGED PAIR. Item UNI4002 * ChromaLuxe™ Photo Panel 3.5” x 5” x 1/4” – 5”x7” x 1/4”. Qty 11/case – Broken cases billed as each. Item UNI5876 * Use this with UNI5875 to create extended imprinted panels. You can add as many center pieces as needed. Qty 6/case – Broken cases billed as each.